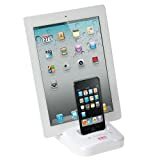 EZOPower Dual Dock Cradle is Genuine Electronic Accessories Licensed by Apple. It is Certified to use Apple Approved Logo "Made for iPod iPhone iPad". The "Made for iPod iPhone iPad" logo means that an electronic accessory has been designed to connect specifically to iPod, iPhone or iPad and has been certified by the EZOPower to meet Apple safety and performance standards. This cradle holds your devices at a comfortable reading angle and provides convenient access on your desk.